Get notified when Burning Man tickets are available! 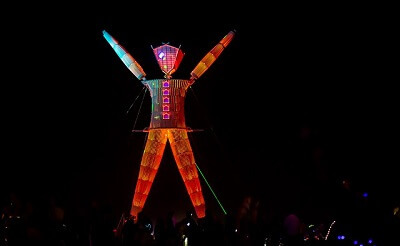 Crackling and spitting in the dark desert night, the burning effigy that lends its name to Nevada’s iconic Burning Man event is perhaps more recognisable from cult film The Wicker Man. However, in Black Rock Desert it signifies only one thing, the start of Burning Man. The green-friendly event even sees its participants clean up after themselves at the end of the festival, thus preserving the beauty and importance of Nevada’s Black Rock Desert. A cultural and artistic phenomenon, the week-long celebration encourages burgeoning artists, self-expression, gift giving and individuality. With a different theme every year this popular event is sure to be a sell-out, so it’s safe to say you should get your Burning Man tickets early if you’re planning on going! When is Burning Man 2019? This year Burning Man will be held on August 25th, 2019. Unless you’re planning on sleeping on the ground in the middle of the desert, you’ll probably want an RV (or something) to sleep in. If you don’t have a van or RV or something of your own, you’re gonna want to rent one, and you can do that at RVShare.com. burning man fomo sale you get tickets?